What happened to those Depression charts? Remember them? That proved our markets were heading down? That earnings would take 20 years to recover. Where did they go? And the sheep that touted them? Where are they now? Whoops. Looks like the linkage has been broken! Since they brought up their Depression charts--let me bring up something from 1904. Yes 1904. Because in Q3 of 1904, the market returned 16.93%. After all, didn't our market return 14.98% in Q3? So what happened in October of 1904? The market went up 10.7%. And how was Q4 in 1904? How about 21.64%. And what was the return in 1905? That's my counter to those that trotted out their Depression charts. 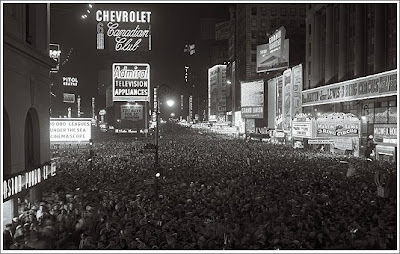 And in 1904, it was the first time that New Year's Eve was celebrated in Times Square. And then, tell the bears where they can go!